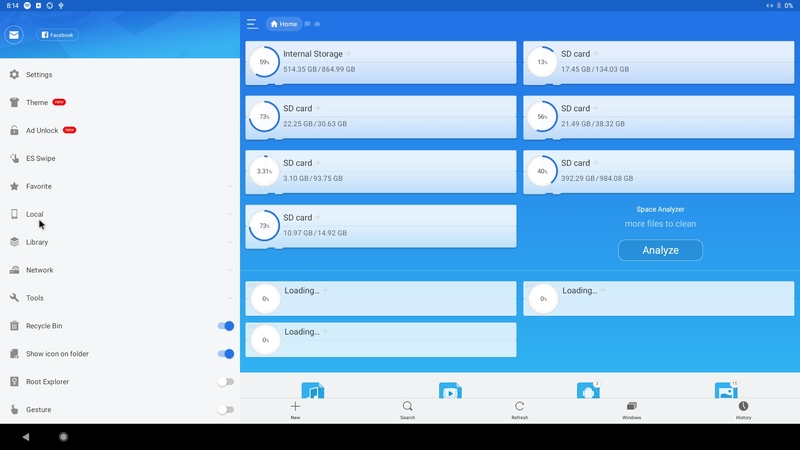 AndEX Pie is compiled by me with sources from Bliss – An Open Source OS, based on Android, that incorporates many customization options and added security features. All AndEX versions are also dependent of the Android-x86 Project’s activity and development. 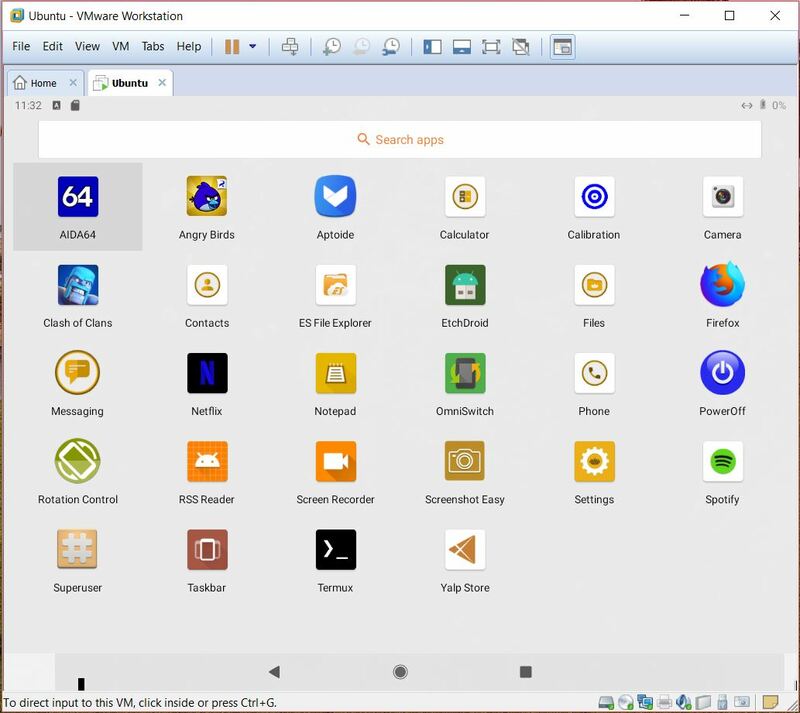 Following Bliss’s instructions you can build your own Android-x86 system. You can also (of course) download Bliss’s “original” image. You shall see this boot animation when AndEX Pie 9.0 is starting up. If not, something is very wrong. 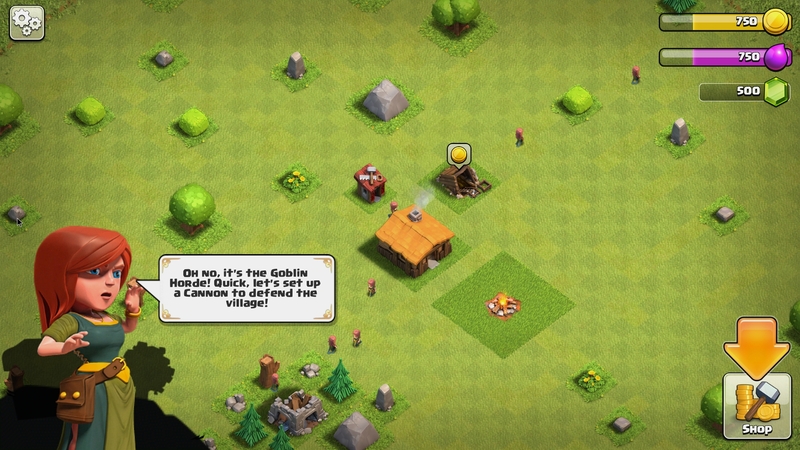 Clash of Clans (a very popular epic strategy game) and Angry Birds (both pre-installed) work very very well. Perfect video quality and audio. 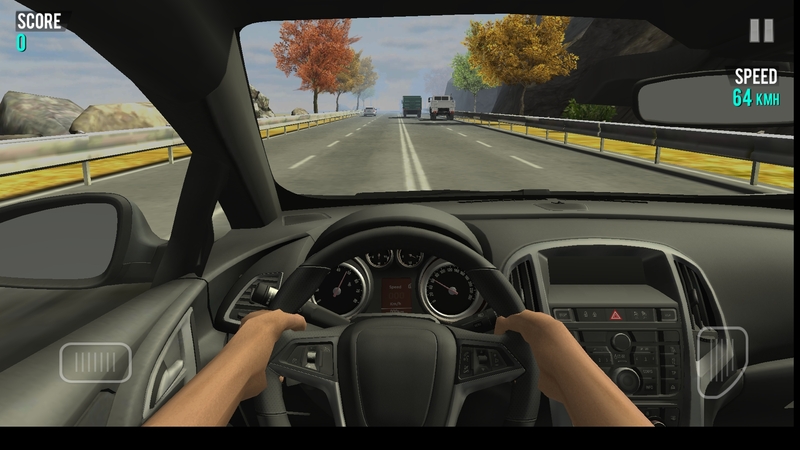 If you have a touchscreen you can also (for example) run Wild Hunt, Flight Pilot, CSR Racing 2, Bowmasters and Shooting King. 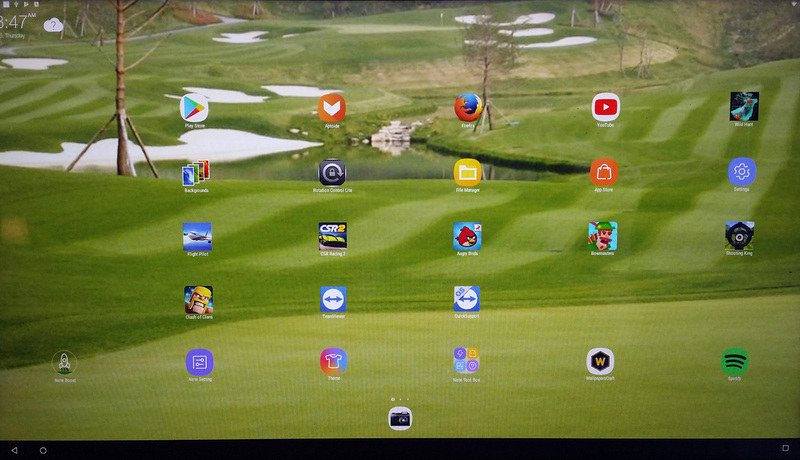 Watch a screenshot of the desktop when I have installed the just mentioned game apps (in AndEX Nougat). The system’s install function does not work in AndEX Pie. You can, however, do a very simple manually installation to hard drive. To be able to do that you must have at least one Linux system installed on your hard drive. You must also use Grub as bootloader. Follow these steps. 1. 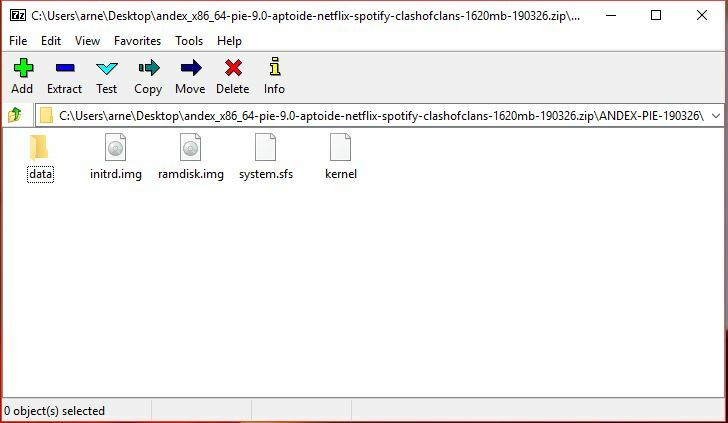 Download the zip file andex_x86_64-pie-9.0-aptoide-netflix-spotify-clashofclans-1620mb-190326.zip. 2. Start up a Linux system (Ubuntu or…) on the computer where you want to have AndEX Pie installed. 4. 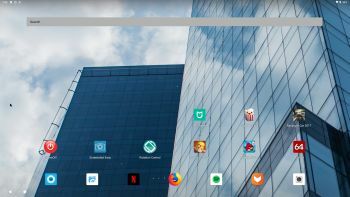 Extract andex_x86_64-pie-9.0-aptoide-netflix-spotify-clashofclans-1620mb-190326.zip to the root (/) of your new partition (formatted as ext4) or to the root of (for example) your Ubuntu system. 5. You will then have a folder called ANDEX-PIE-190326 with five files – the folder data, initrd.img, ramdisk.img, system.sfs and kernel – see the picture below. The folder /ANDEX-PIE-190326/data is very important! All your system changes will be saved to the folder data. You can’t even run the system without it. When you have the folder ANDEX-PIE-190326 in the right place it is time to configure Grub so you will be able to boot up AndEX Pie – see the examples below. NOTE 2: The DPI=160 entry provides a hint about the display’s pixel density in dots per inch. This is an important setting – if the Android display’s icons and text look too small and crowded, increase this number. If things seem too big, make it smaller. 2. Start up ExLight and download the ZIP file andex_x86_64-pie-9.0-aptoide-netflix-spotify-clashofclans-1620mb-190326.zip to / – i.e. to the root of your filesystem. 3. Extract the Zip file. You will then have the folder ANDEX-PIE-190326. Delete the zip file. 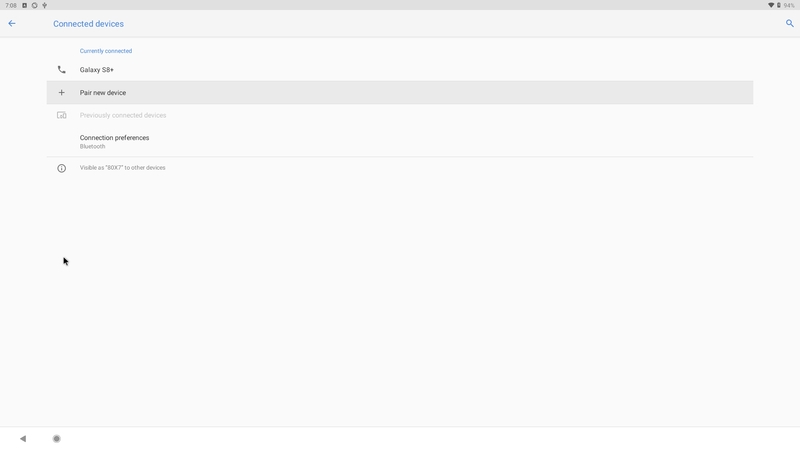 You can (of course) run AndEX Pie in any language. Just go to Settings and change to your preferred language. The changes will take immediate effect. Wifi works alright in AndEX Pie. Just go to Settings and turn Wifi on. Just press gently on Ctrl Alt Delete keys simultaneously and you will get two alternatives. Power off or Restart. If not you can use the app PowerOff – screenshot. Note: When running AndEX Pie live (i.e. from a DVD or USB stick or live in VirtualBox or VMware) it can happen that you get an error message when you try to start Netflix. Just try again (up to about five times) and/or wait a few minutes. Everything will be alright after that. When running AndEX Pie from hard drive Netflix starts immediately when you want (with perfect video and sound quality). 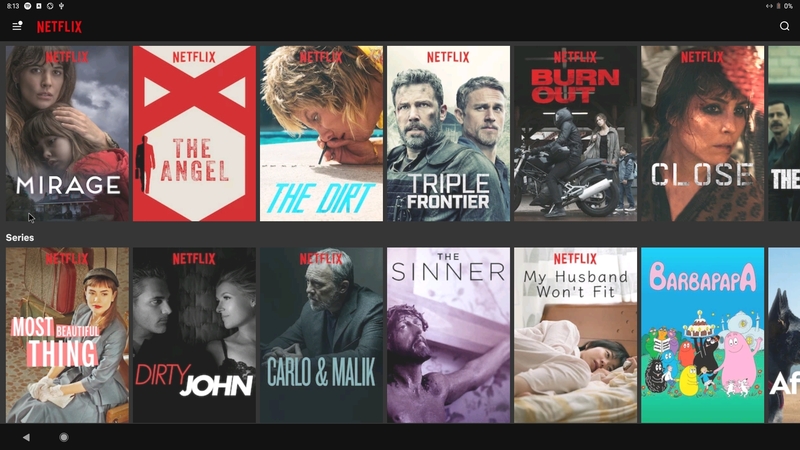 Note also: Whatever you do don’t try to upgrade Netflix. No other version than the one pre-installed will work. 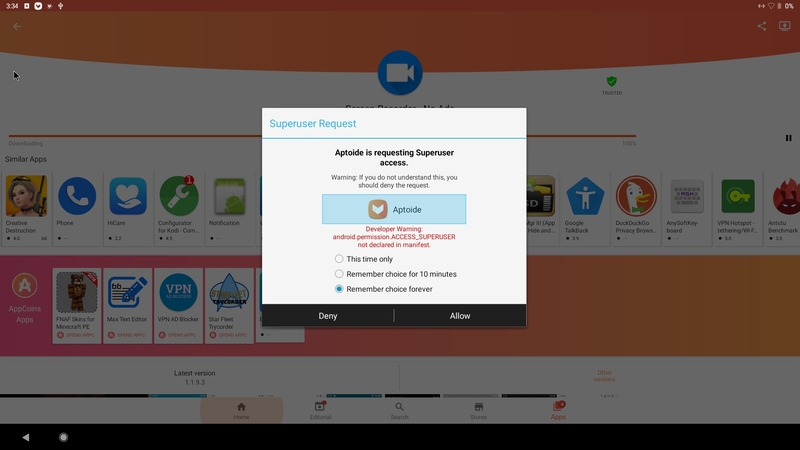 So don’t upgrade even if Aptoide wants you to do it. 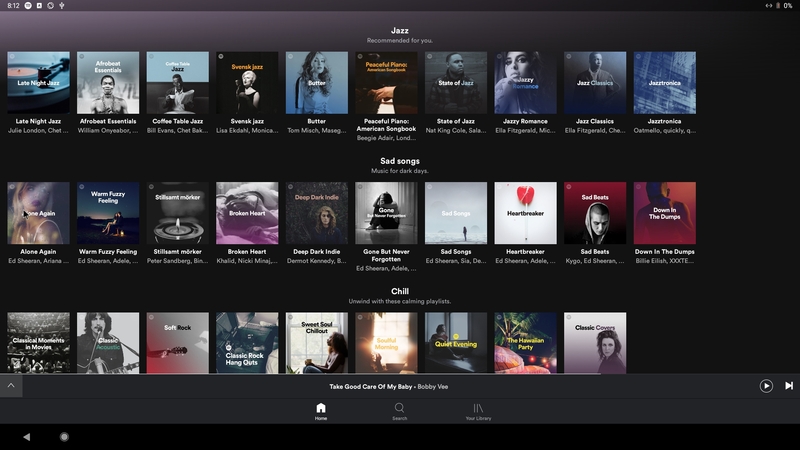 Just start the Spotify app and log in. You must be a premium subscriber to be able to use the app. 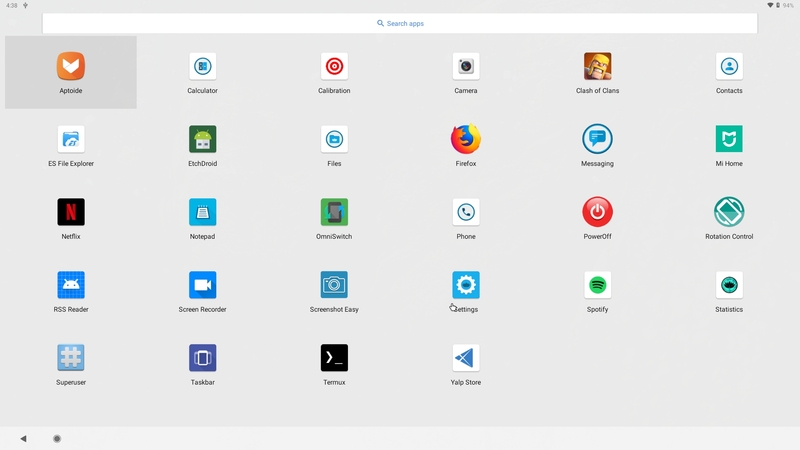 You can run AndEX Pie Build 190326 (from the ISO file) live in VirtualBox and VMware. You can however not install AndEX 9.0 to a virtual hard drive in VMware. I.e. the install function doesn’t work. You can, however, do a manual installation as describe above under Manual installation of AndEX Pie in VirtualBox and/or VMware. You must use a fairly new/modern computer. 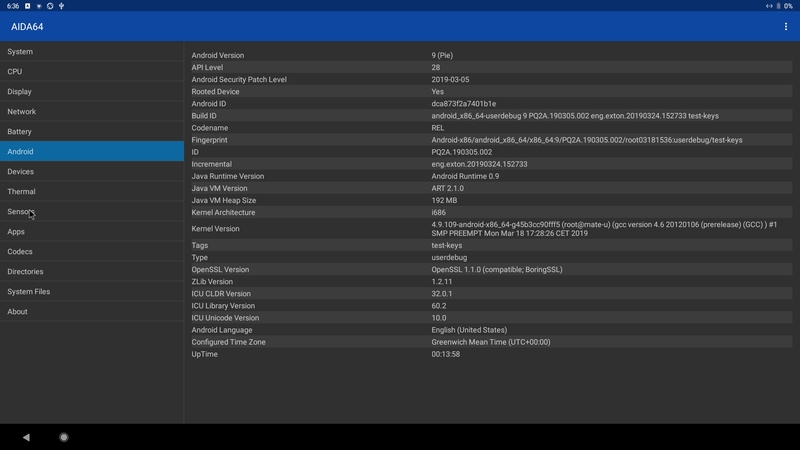 Android-x86_64 Pie won’t run (even start) on older computers. My other Android remaster KitKat 4.4.4 Build 180108 will run also on older computers. 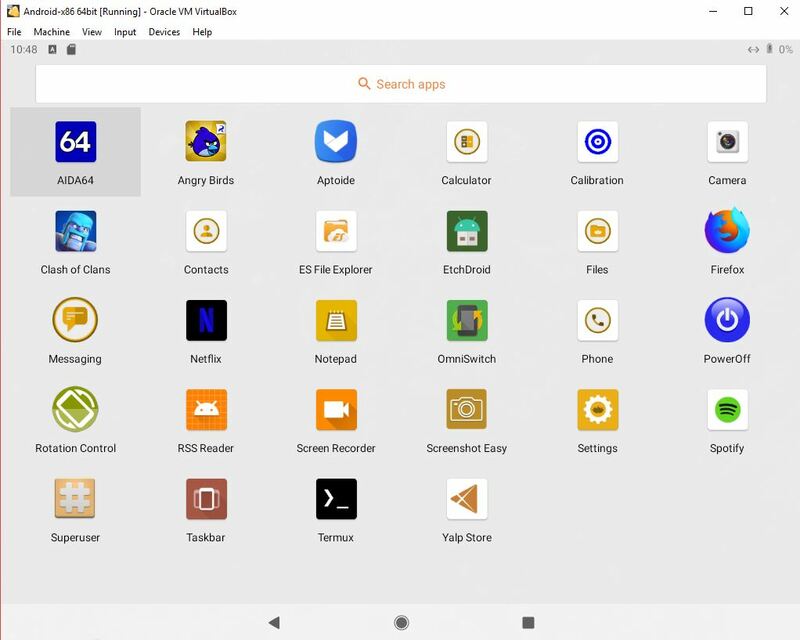 Before you buy and download this version of AndEX Pie you must be aware of that not all apps downloaded with Aptoide App Manager can run in an Android-x86_64 system. Some very big (around 1GB) games for example won’t run. 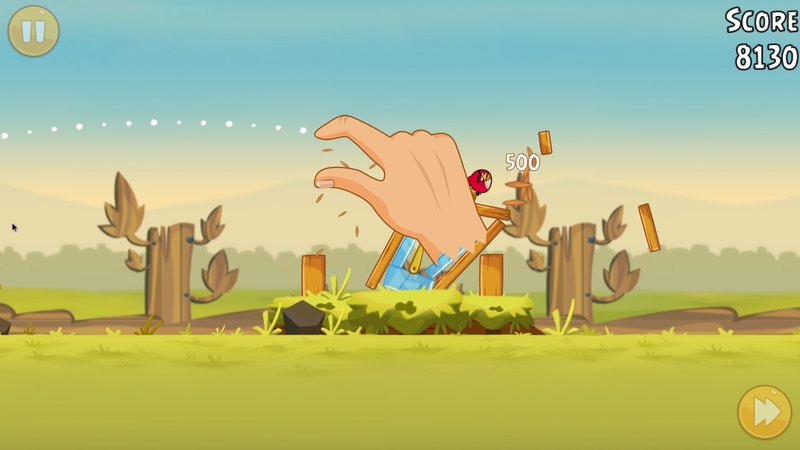 You must also be aware of that some (many) games need a touchscreen. Clash of Clans and Angry Birds (pre-installed) work very well though. 1. You can run the system live in VirtualBox and VMware, but unfortunately with strange colors as screenshot 1 and screenshot 2 show. You can also do a manual installation as describe above under Manual installation of AndEX Pie in VirtualBox and/or VMware. 2. Bluetooth doesn’t work. 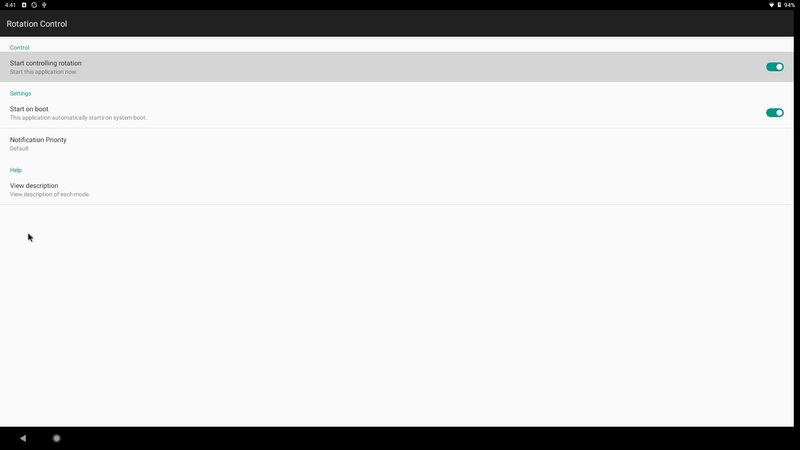 (You can enable Bluetooth and see units though – screenshot). The system can be installed manually to hard drive – see above. That’s sort of a FRUGAL installation used by Puppy Linux. To be able to do a frugal installation you must have at least one Linux system installed on your hard drive. You must also use Grub as bootloader. 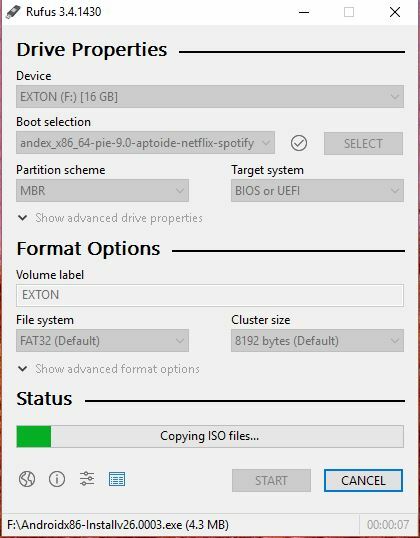 Running AndEX Pie live: Use preferably Rufus to create a bootable USB stick from the ISO file andex_x86_64-pie-9.0-aptoide-netflix-spotify-clashofclans-1650mb-190326.iso. Or burn the ISO file to a DVD and run the system from it. 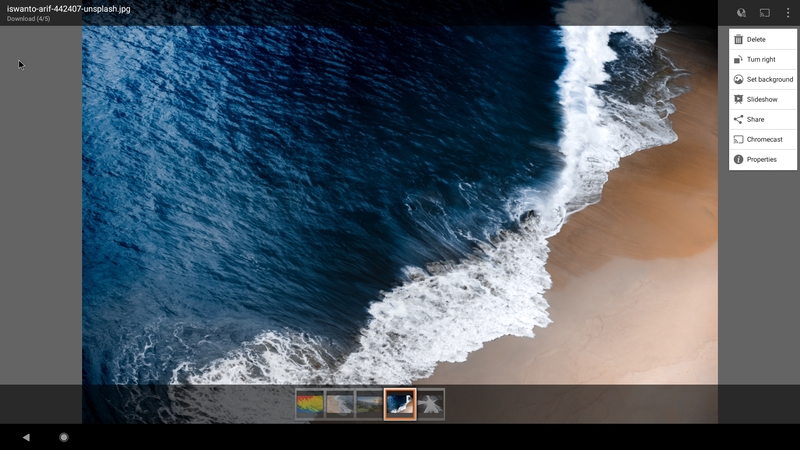 While using/running Rufus in Windows it will look like this.